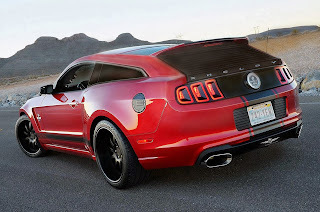 You might recognize this custom Mustang as it debuted at the 2009 SEMA Show. 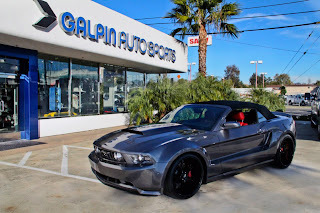 Built by Galpin Auto Sports, the 2010 Mustang convertible features a hand-built metal widebody kit that adds six inches to the width of the car, a custom PPG two-tone paint job, Forgiato wheels, unique leather seats and a 900 watt JL audio system. The car isn’t all about looks, though. Under the hood is a Ford Racing supercharger system good for 550 horsepower, and additional performance items include Wilwood brakes, a Ford Racing suspension handling pack, McLeod clutch and flywheel and a one-piece driveshaft. We have no idea how much it cost Galpin Auto Sports to build this Mustang, but we’d imagine that the custom bodywork and suspension goodies were quite expensive. That’s why it’s surprising that when the car went up for auction at Barrett-Jackson in Orange County this weekend that the final selling price was a mere $50,600. This 2010 Ford Mustang GT Convertible was created by Galpin Auto Sports and featured in Ford’s booth at the 2009 SEMA show in Las Vegas. The GAS team added a Ford Racing 550hp supercharger, Ford Racing handling pack, Hurst shifter and more. This 2010 Ford Mustang GT convertible was created by Galpin Auto Sports and featured in Ford’s booth at the 2009 SEMA show in Las Vegas, as well as in Mustangs and Fast Fords Magazine August 2010 issue, Top 10 SEMA Rides for 2009, Mustangs and Fast Fords Magazine Top 10 Mustangs of 2010 and Mustangs and Fast Fords 2010 calendar. 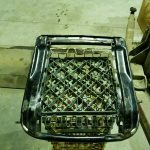 Styling features include GAS hand-fabricated, all-metal wide body exterior that adds a total of 6″ to the width of the vehicle, as well as a PPG custom two tone gloss black and pearl Grabber Blue paint with silver accents. This is a true American thrill machine. The GAS team added a Ford Racing 550hp supercharger, Ford Racing handling pack, Hurst shifter, JPC 1-piece aluminum driveshaft and a McLeod aluminum flywheel and dual disc clutch. The faster you go, the quicker you are going to need to stop, so GAS installed Wilwood brakes and 20″ Forgiato aluminum Mono Leggera Pinzette wheels with high performance Pirelli tires. Interior details include custom leather seats, Ford Racing custom backlit door sill plates and a JL audio sound system with 900 watts. This amazing car is equally exhilarating whether you are on the road with the top down or in the city for a night on the town. Added factory options include navigation, exhaust system and Grant steering wheel. 6,080 original miles. 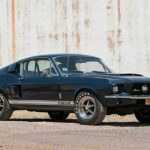 This entry was written by by MustangsDaily (Mustangs Daily) and posted here on Sunday, June 24th, 2012 at 8:37 am and is filed under barrett-jackson, barrett-jackson oc, barrett-jackson oc 2012, galpin, galpin auto sports, galpin widebody mustang, News, widebody mustang. This article was not written by us, rather gathered using RSS feeds listed here. We take no credit for this article. You can leave a response, or trackback from your own site.